It's no secret that creating a positive company culture drives employee engagement and ultimately improves the bottom line. It seems that every publication, influencer, and organization that specializes in business performance from Gallop to Forbes is emphasizing that culture is everything in today's workplace. Its stable leadership team – the CEO and CTO have both been with the company for more than 11 years. Its market leadership position – 30 of top 100 F&B companies run TraceGains. And its fast growth – 18 new logos added in the first quarter of 2019 alone. But there’s one thing that I’m most proud of and that’s our culture of giving back. Over the holidays, TraceGains employees donated coats, hats, and gloves to the Mercy Center for Hope, and we built more than 30 bikes for the Westminster Fire Department’s fund drive. Last month, my colleague Ian Buljung shaved his head when he hit his fundraising goal to raise money for St. Baldrick’s to fight childhood cancer, which was largely met due to support from his co-workers. As a working mother, I often reflect on how grateful I am for getting to do what I love to support my family. I also think about other parents who struggle every day to support their families. Trying to imagine how it would feel if my children were hungry and I couldn’t feed them is painful, and the hard truth is that there are many women and men, right here in my own community, who are facing this harsh reality right now, unsure of where their next meal will come from. This year, 224,000 kids struggle with hunger every day in Colorado. Many low-income children in Denver rely on free and reduced meals at school; often the lunch they receive at school on Friday is the last meal they eat until Monday. That’s where Food For Thought can help – they provide PowerSacks, food packed and sent home with children to end weekend hunger. Food For Thought is 100 percent volunteer-run, meaning all donations go straight to feeding a local child. In addition to a team from TraceGains packing PowerSacks on April 19, we’re hosting a pub trivia night at 7 p.m. on Tuesday, April 23, at Marco’s Coal-Fired Pizza for attendees of our annual user conference (TGCon) along with family and friends. We’re working to raise $2,000 by TGCon to donate to Food For Thought. By hitting this goal, we can feed 500 children! TGCon Registrants: Sign-up to attend the TGCon trivia night! Your $15 ticket will pay for PowerSacks for three local kids, and feel free to share with friends and family. We want a big crowd! My colleagues and I are committed to a true partnership with Food For Thought, so this is just the beginning. 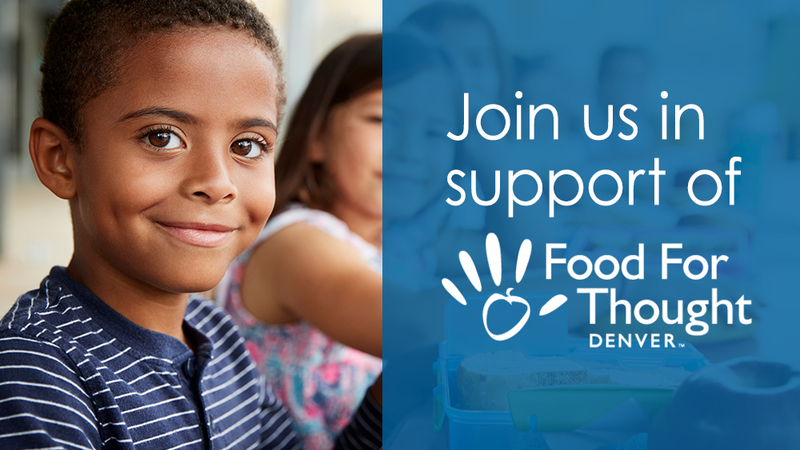 Let’s work together to show Food For Thought-Denver and the children in our community how generous the TraceGains community can be and exceed our targets for this first donation.